The 411 Foodies…we come in all shapes, sizes, and backgrounds, all with different preferences. Our preferences differ from person to person, but at the end of the day we all love good food. A while ago I contacted a fellow blogger from The Butter Melts out of habbit, whose site I have been following as of recently. We spoke of doing a brunch rendezvous and managed to meet two other bloggers, Gluttoners and the sassy foodophile . 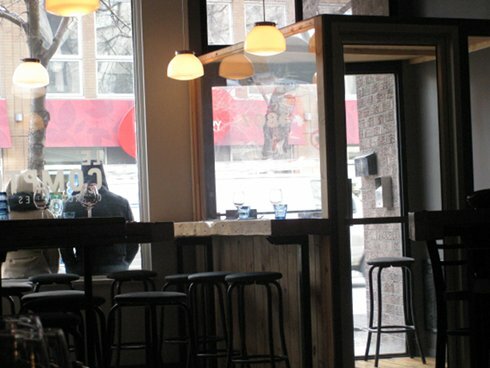 Now we have four foodies and need to find a new brunch spot that no one has been to… so, no pressure whatsoever… So, when all else fails I go to my handy list of spots and go over every one and see if it’s foodie enough. 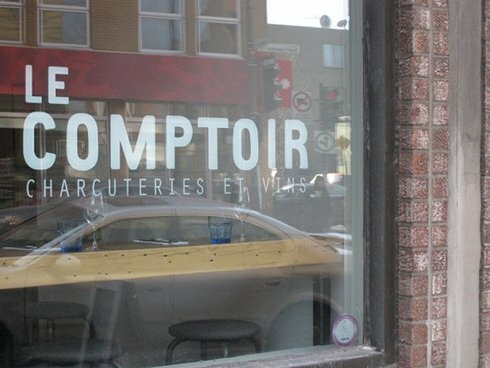 Now, the risk of having a foodie brunch is that you may end up with something that resembles lunch, so after some research Le Comptoir made its way to the top of the suggestion pile. At 1st glance Saying that reservations are recommended is an understatement; I mean, this place is jammed, and for good reason since it has earned itself a reputation amongst foodies for plating some impressive dishes. Now showing up without a reservation does not mean you won’t get a spot, it just means you might wait a while, and if you go in the peak period you will definitely wait a while, so save yourself the headache and make the call. The menu goes through various changes so some of these items may not be there when you go, but it should give you an idea of what to expect. The menu has less than twelve items and that’s counting the dessert and drink options. Many of the dishes have breakfast items at the core and non-brunch items accenting the dishes. Your average dish will start at the $12-plus range and does include coffee. Don’t expect to find basic bacon and eggs here, but do expect blood pudding, a spin on scrambled eggs, a breakfast sandwich and some other tasty dishes. So, having given a glimpse at the menu let us look a little closer in detail to see how the brunch measures up. 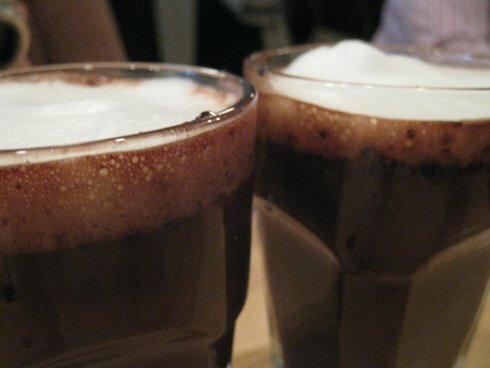 We all started with the spiced hot chocolate ($5.00), which was thick, rich and delicious. It was a true pleasure to nurse it through my entire meal and have the last drop in the glass. The hot chocolate has accents of cinnamon, chilli and a rich dark chocolate, which takes you a trip to deliciousland. Now this works really well in the winter, so I’m curious to see what the summer drink equivalent will be, but if it is as good I will be lining up for it. Now that we moved onto the solid dishes lets see what they are like. We ordered four dishes in total. The salmon tartare ($15) is first on the tasting block. 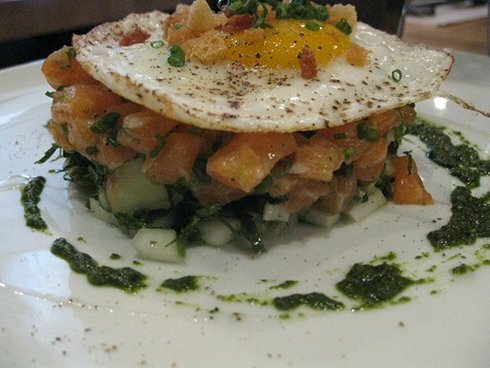 This dish has Loch Duart salmon, herbs, and is topped with a fried egg. Now you may ask “what is Loch Duart salmon?” Well, it’s a special salmon from Scotland, and it is supposed to have a reputation for excellence, being sustainable and organic. The tartare was excellently plated and quite tasty; the fried egg on top was a nice touch that made it kind of breakfasty. This is a nice touch for those who like a tartare in the morning, although it is not something you often find on the menu, and it is a deviation from what one would normally have for brunch, but the egg works to bring it back. Next is the Scrambled Eggs Dish ($14), which has a scrambled egg base with smoked duck, and truffles in the mix. The dish is topped with some greens, and has a few pieces of bread in it. The smoked duck and truffles really make this dish rich, and offers you some bang for buck considering neither duck nor truffles comes cheap. 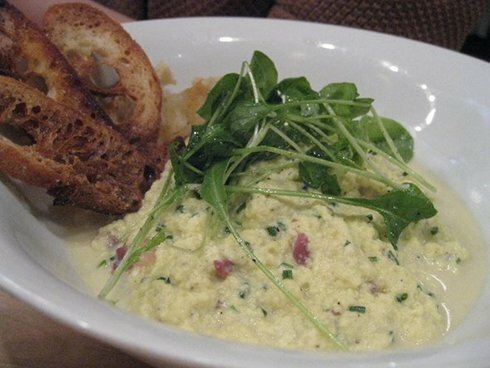 However, the scrambled eggs had liquid collecting at the bottom, which took away from the presentation and plating. The eggs were good, though a touch wet, but the smoked duck and truffles are the highlights of the dish. 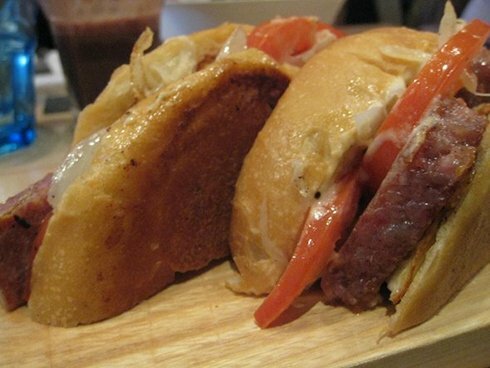 Next came the breakfast sandwich ($12) which consisted of bread, tomato, cotechino and egg. Cotechino is an Italian cold cut, which I don’t even think I have had before. It is best described as a type of salami, and what I do know is that it was tasty. The dish was served on a single wooden plank and came with salad in a bowl on one end of the dish. The dish was tasty, and it was nice to see something different like cotechino. The sandwich was quite filling and the taste was good, although for $12 I was expecting a little better. I did also find that the mechanics of the burger and the plank used for plating an issue. Simply put, I had a single plank to act as a plate, and part of the sandwich could, and did, fall on the table since the plank was too small to catch all my messiness. The salad was a nice touch and refreshing; I normally don’t like salads with my brunch but this works, as it helps clean up the palate and helps make space for their yummy desserts. 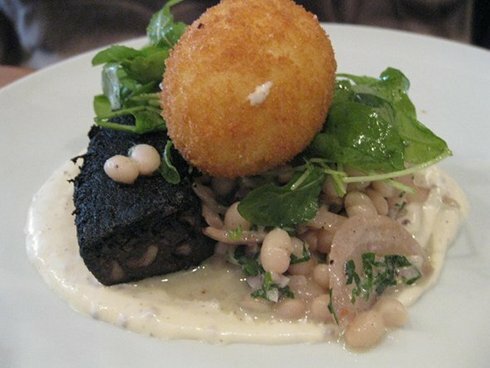 The last of our main dishes was the black Pudding ($14), which is a blood sausage with a panecote covering on a poached egg, greens, and beans. This dish was a success; the taste was impressive, the plating was beautiful, and it was filling and original. I mean, the poached eggs with panecote covering is rare in this city; in fact, I can only think of one other place in the city that has that, so big time points for being original. This dish, in my mind, was the clear winner. 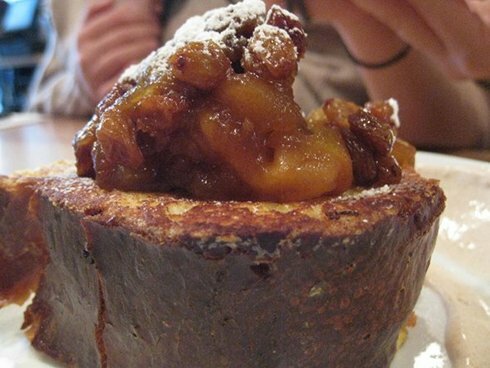 It combines various breakfast and lunch elements, and brings them together in a delicious marriage. The blood pudding was tasty and the poached egg was well done. Now as a dessert we were curious about the dessert Brioche ($8), which was topped with caramelized apples, some raisins, sour cream and cinnamon. The sour cream was on the side and was great for scooping it up with the brioche bread. The caramelized apples and the raisins offer a lovely sweetness. The brioche bread was large yet light. This is supposed to be an appetizer dish and sharing it was fun since we were generally all full, and the price is pretty good. Service started off slow. We waited a while to get our orders taken, although it seemed as if they were short-staffed since our greeter was also our waiter. As the meal evolved the service improved and at the end, even though the kitchen was closed, they made the brioche dish for us, which was very nice of them. Although I do suspect that they knew we were bloggers by the end since we kind of talked shop amongst ourselves and kept taking pics of our food… However, at that point we had already received our dish so there was no way that it could have been biased, as in if they tried to make it better or nicer since they found out after the fact. Almost all the dishes have meat in them; there is an item or two that don’t, but keep in mind that it is a short menu. As well do not expect health menu items like cottage cheese or egg white omelettes. If you are a foodie try this place out, you will definitely like it. The menu will likely change but you can expect lovely presentation, a creative mix of ingredients, and impressive flavours working in unison. Even though I had a few small issues, I would go back again and try out some different dishes, as the adventure aspect alone of trying new dishes makes it worth it for me.